The information contained on this server could include inaccuracies or typographical errors. Doug Webb makes no representations about the suitability of the information contained on this server. All documents and analysis are provided "as is" without warranties of any kind. Doug Webb hereby disclaims all warranties and conditions with regard to the information, including all warranties and conditions, including all implied warranties and conditions of merchantability, fitness for a particular purpose, title and non-infringement. In no event shall Doug Webb be liable for special, indirect or consequential damages arising out of or in connection with the use of information available on this server. 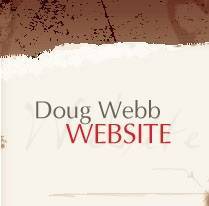 This Site (DougWebb.us & DougWebbJazz.com) may contain links to third party Internet sites. Your access to any other site linked to this Site is at your own risk, and Doug Webb is not responsible for the accuracy or reliability of any information, data, opinions, advice or statements made on these sites. Doug Webb provides these links merely as a convenience, and the inclusion of such links does not imply an endorsement or recommendation of any kind.